The Rosenburg Traveling Scholarship is given to one University of Oregon undergraduate architecture student every year, based on a proposal the student submits to the department. I started research on the Uruguayan architect Eladio Dieste in the Winter of 1997 and, after receiving the scholarship in February, I traveled to Uruguay the following November to further my research and eventually meet the architect. Upon my return, I compiled the research and graphic documentation into an exhibit. 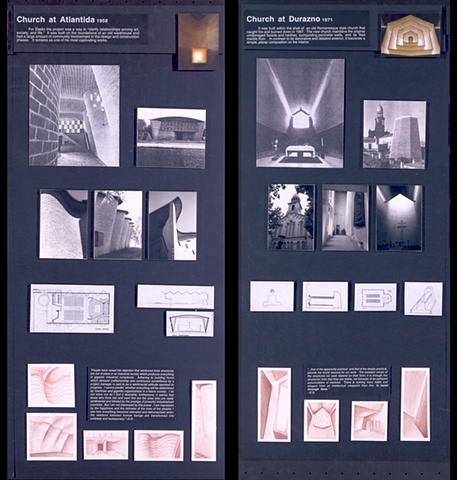 A few of the boards associated with the exhibit are shown here. “Since the start of his career, Dieste has been faithful to masonry. This has given him an intimate understanding of the material. What may normally be seen as something prosaic is pushed to new extremes. He is aware of its limitations and, more importantly, its possibilities, structurally and aesthetically. The consistency of form and material has allowed for a continuous refinement of each successive project from the previous.” --A.A.